Two movies to be released this month are about the plight of women and girls living in Islamic countries, a record of sorts, especially since each of them is a human rights film. Both Haifaa Al Mansour’s Wadjda and Atiq Rahimi’s The Patience Stone were screened at Tribeca Film Festival this year, and are being distributed by Sony Pictures. It is unusual and heartwarming when major distributors decide that women and girls are a “market.” While both movies appeal to general audiences, they also assume a feminist perspective, and criticize the exclusion of women and girls from public life in Islamic countries, namely Saudi Arabia and Afghanistan. I spoke with Saudi filmmaker Ms. Al Mansour, the first woman to make a movie on-location in Saudi Arabia, on two occasions this year, most recently in July for an interview that will be published in the Fall print edition of Cineaste Magazine, along with my review of the film. My earlier Tribeca Film Festival interview with Ms. Al Mansour has just been published in Film Journal International. (See link in "Feature Articles, Print/Online.") Ms. Al Mansour makes her feature debut with Wadjda, which centers on a determined 10 year-old Saudi girl. The film will open in New York City at the end of August. While the two interviews cover different topics, both contain discussions of the position of women and girls in present-day Saudi Arabia. 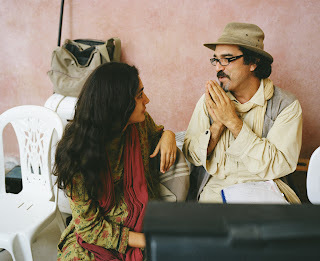 Under “Feature Articles,” I have posted a link to my interview with Afghani writer-director, Mr. Rahimi, the lead story in this week's Film Journal International. The Patience Stone will open on August 14th at Film Forum in New York City. It stars the wonderful Iranian actress Golshifteh Farahani, who plays an Afghani wife and mother struggling to survive after her husband is shot and lapses into a coma. During the long hours she cares for him, she confesses her many disappointments in their married life. Those familiar with Iranian films will remember Farahani as the star of Samira Makhmalbaf’s Cannes Jury Prize Winner, Blackboards (2000), and more recently for her role in the ensemble film, Asghar Farhadi’s About Elly (2009). Rahimi’s second feature (his first was Earth and Ashes), in his native Dari (a dialect of Farsi), is based on his book of the same name, and was filmed on-location in Kabul and Morocco.